redeyedvireo, originally uploaded by jahansell. Out in the back yard with the girls and suddenly something falls out of the sky, bounces off the roof and hits the grass. 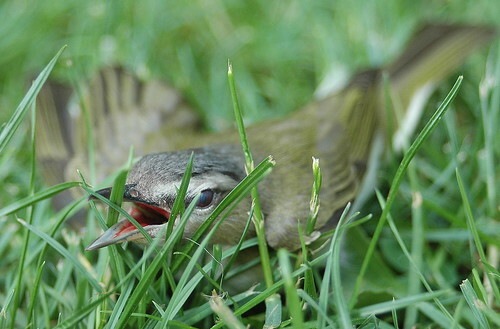 This bird was, at first, head down in the lawn, but when I touched it to see if it was dead, it looked up. Turns out it was a red-eyed vireo - you can't see the red so well at this angle, but here's another one where you can see it a bit better. I hoped it was just stunned, but my DH (who knows birds!) thought it had a broken wing. We contemplated calling Audubon, but it was the holiday weekend and we figured nobody was around. So we left for a few hours and when we came back it was gone - either it recovered its equilibrium and flew away, or someone - cat? hawk? - got it. The circle of life! Hopefully the little guy was just stunned. Last week we were sitting in our bedroom and heard a loud bang on the window and walked outside and a bird was just sitting there, not moving. We went over to it and it let us touch it and then it started slowing hopping away and then flew off. I think it was just stunned, it hit hard enough to leave feathers on the window.